In residential environments, and throughout history, a Showcase Stair may symbolize the status of home owners, contribute to an aesthetic, provide a stage set or provoke a sense of risk and insecurity to its users. Showcase Stairs appeared in palaces during the Middle Ages as helical stairs were dismantled from their surrounding walls and revealed to become a symbol of status. According to John Templer, writer of the first theoretical and historical stair analysis, helical stairs received special attention and “were transformed from dismal holes into sculptural” objects for “pride and prestige.”4 At the Chateau de Blois, the great stair built by Francis I (1515-1525) became a Showcase Stair by opening itself to the exterior with dissolved walls, but although opened outward it remained closed inward as the newel post existed. At the Chateau de Chambord (1519-1547) in Loire, France, Showcase Stair evolved to reveal the exterior stair walls and the newel both vanished. As stair boundaries disintegrated, stairs not only became visually accessible to its viewers but also the surroundings became visual to its users. From the Blois stair the user is able to experience a changing exterior view, which according to Templer is a richer and more dramatic experience than any of the greatest medieval vises.5 About stairs that are void in the middle, as the Chambord stair, Palladio states that they are successful because “those that are at the top of the stairs, see all those that come up, or begin to ascend, and are likewise seen by them.”6 The openness of the stair makes it easy to locate oneself in relation to the surroundings as well as it facilitates locating the stair which becomes a luxury to be showcased. According to Leah Scolere, Showcase Stair exhibits the movement of those using the stair by drawing attention to the up and downward circulation.11 A precedent was set with the Crystal Palace (1851) in which the stairs were designed as a stage not only to see but also to be seen.12 In John Mckean’s words, the Crystal Palace stairs were “explicitly for gazing without interruption.”13 An uninterrupted view, made possible during the 19th century through the thinness of the new materiality available –steel and glass- that reduced to a minimal expression the structure of the stair. The view without obstacles was mostly apparent during the 1920s and 1930s with the streamline nautical looking stairs of the International Style. Marcel Breuer and Walter Gropius pushed the concept further in the Frank House (1939), by creating a stair that was not only minimal in its composition but precious and likely to be showcased in a glass vitrine. During the 1960s and 1970s Showcase Stair took a step backward by acquiring a ceremonial look reminiscent of the stairs of the Middle Age palaces, but in a smaller scale. In the 1980s and 1990s it evolved to create a playful environment. The stair became an expression of art that freely lingered throughout the space providing its users with an adventurous feeling. In the Round Hill house (1985) in Woodbridge, Connecticut, Herbert Newman created a ribbon like stair that crossed over the central courtyard of the house giving the sensation of flying over the space. Similarly, in the Chmar House (1991) in Atlanta, Giorgia, Scogin Elam and Bray Architects camouflaged the stair as a wooden parapet in the corner of the living room making it unrecognizable and a challenge to find. Although the attractive forms the stair acquires are highly visible, they exhibit the stair in a way that does not resemble a staircase. The stair is fully detached from its functional quality to become a work of art enhancing the spatial experience of the residence. In the 21st century Showcase Stair is dematerialized appearing to be weightless, fragile, and insecure to be used. According to Leah Scolere dematerialized stairs evoke feelings of apprehension creating a cautious response to movement on the stairs and heightening the awareness of one’s own presence in the space.14 In Small House (1991) in Tokyo, Kazuyo Sejima creates an extremely narrow and thin stair, were the railing is almost absent. The delicacy of the stair makes it appear a work of origami that barely seems to support oneself. 1) Leah Scolere, “Theory Studies: Contemporary Retail Design” (MA Thesis, Cornell University, 2004), 69. 2) Scolere, “Theory Studies," 69. 3) John Templer, The Staircase: History and Theories (Massachusetts: MIT Press Cambridge, 1992), 23. 4) Templer, The Staircase, 60. 5) Templer, The Staircase, 64. 6) Templer, The Staircase, 74. 7) Joy Monice Malnar and Frank Vodvarka, The Interior Dimension: A Theoretical Approach to Enclosed Space (New York : Van Nostrand Reinhold, 1992), 244. 8) Malnar and Vodvarka, The Interior Dimension, 121. 9) John Pile, A History of Interior Design (New York: John Wiley & Sons Inc., 2000), 198. 10) Malnar and Vodvarka, The Interior Dimension, 141. 11) Scolere, “Theory Studies: Contemporary Retail Design,” 69. 12) Scolere, “Theory Studies: Contemporary Retail Design,” 69. 13) John McKean, Crystal Palace: Joseph Paxton and Charles Fox (London: Phaidon, 1994), 30. 14) Evidence for the use and the chronological sequence of Showcase Stair as a house archetype was developed from the following sources: 1950 Foyer, Edgar B. Lau House  Pancoast, Fernendino, Skeels and Burnham, Architect; James Merrick Smith Associates, Interior Design, AID; FL in Anonymous, "Triumvirate of Tastes," Interior Design 27, no. 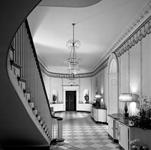 11 (Nov. 1956): 78; PhotoCrd: Anonymous / 1960 Private House  Jukia K. Gosliner, AID, Interior Design; Location Unknown in Anonymous, "Integrated Design," Interior Design 34, no. 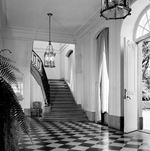 11 (Nov. 1963): 111; PhotoCrd: Anonymous / 1970 Shater House  James B. Baker; Annandale-on-Hudson, NY; in "Record Houses 1971," Architectural Record 151, Record Houses of 1971 (May 1971): 62; PhotoCrd: Otto Baitz; Private House  King-lui Wu; Killingsworth, CT; in "Record Houses 1975," Architectural Record 175, Record Houses of 1975 (May 1975): 67; PhotoCrd: Robert Perron / 1980 Round Hill House  Herbert S. Newman; Round Hill, CT in "Round Hill House," Architectural Record, Record Houses 1985 (Apr. 1985): 128; PhotoCrd: Norman McGrath / 1990 Chmar House  Scogin Elam and Bray Architects; Atlanta, GA in Karen D. Stein, "Tree House," Architectural Record, Record Houses 1991 (Apr. 1991): 85; PhotoCrd: Timothy Hursley/The Arkansas Office; Joe and Etsuko Price House  Bart Prince Architect; Orange County, CA in Aaron Betsky, "Fantastic Voyage," Architectural Record, Record Houses 1991 (Apr. 1991): 111; PhotoCrd: Scott Frances/ESTO; Long Island Spec House  Ivan Dolin and Deborah Habicht, Interior Design; Long Island, NY in Edie Cohen, "Ivan Dolin and Deborah Habicht," Interior Design 62, no. 2 (Feb. 1993): 102; PhotoCrd: Durston Saylor; Mary Douglas Drysdale House  Mary Douglas Drysdale, Interior Design; Washington, D.C. in Monica Geran, "Mary Douglas Drysdale," Interior Design 64, no. 1 (Jan. 1993): 100; PhotoCrd: Gordon Beall / 2000 Small House  Kazuyo Sejima and Associates; Tokyo, Japan in Naomi Pollock, "On a Tiny Lot in Downtown Tokyo," Architectural Record 189, no. 4, Record Houses 2001 (Apr. 2001): 125; PhotoCrd: Shinkenchiku-Sha; Town House  Peter Pennoyer Architects; Victoria Hagan Interiors; New York City in "Merit Award," Interior Design 77, no. 15 (Dec. 2006): 94; PhotoCrd: Eric Laignel; Xeros House  Blank Studio; Phoenix, AZ in Suzanne Stephens, "Xeros Residence," Architectural Record 194, no. 4, Record Houses 2006 (Apr. 2006): 139; PhotoCrd: Timmerman Photography. 2) Mendez, Marta. “Theory Studies: Archetypical Practices of Contemporary House Design.” M.A. Thesis, Cornell University, 2008, 116-128.